Run out of ideas of what to do with the kids already? Fear not – The Works in PE1 has plenty of fantastic crafty ideas to keep little ones distracted this half term, without spending a fortune. Every child loves to use crayons, paints or pencils and create their own imaginative world of colour. As well as an extensive range of colouring books, The Works also has great value crafting kits, where children can design and paint wooden animals, jigsaws, piggy banks and picture frames. Dough modelling is something that has always kept children entertained. Why not add more interaction with this activity by incorporating a game? Ask your child to create an animal or object with the dough and then try to guess what it is. Take it in turns, so they can guess what you have made too. To encourage memory skills, take balls of dough in different colours and hide each one under an identical cup. Mix them around and ask your child which colour is under which cup. Encourage little ones to get crafty by making Easter greeting cards. By using coloured paper, paints, beads, wooden accessories, glitter and ribbons, they can create bespoke cards for their friends and family. Be sure to assist children if any cutting is involved. If your child likes jewellery, then jewellery making could be the answer to their half term boredom. With a variety of beads and bead threading string, you can let their imagination run wild. Check out the selection of beads in-store at The Works. Easter wouldn’t be Easter without bunnies! 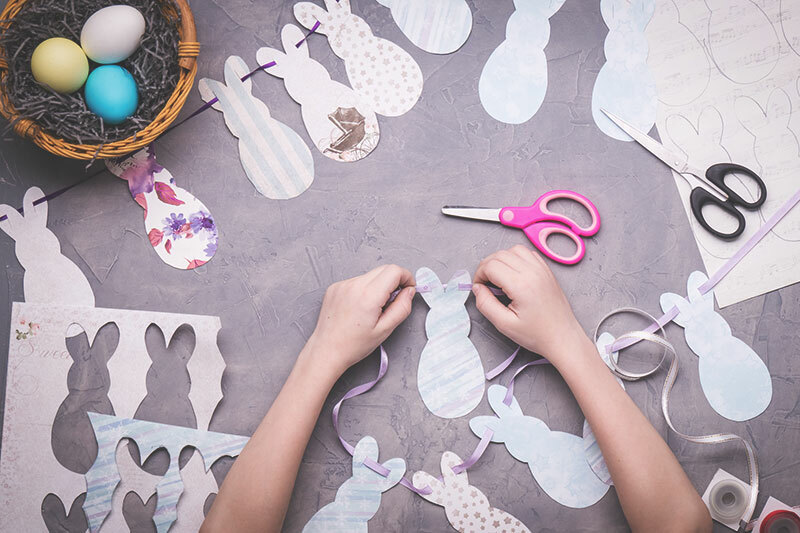 Creating bunny bunting is the perfect way to keep children occupied and also ensures your home looks suitably hoppy over the holidays. Head to The Works for all the materials you need. Draw a simple rabbit shape onto card and cut it out. This is the template for the bunting. Place the template on the chosen card and draw around it. This will need to be done several times, depending on how many bunnies you want on your bunting. Cut each bunny out. Use colouring pencils on any white card to create a design or pattern. Glue some cotton wool onto each bunny, creating the effect of a fluffy tail (if desired). Measure out the correct length of string or ribbon for your bunting. Affix each bunny to the ribbon/string by cutting a hole in the ears and threading it through. Hang your bunting and admire! 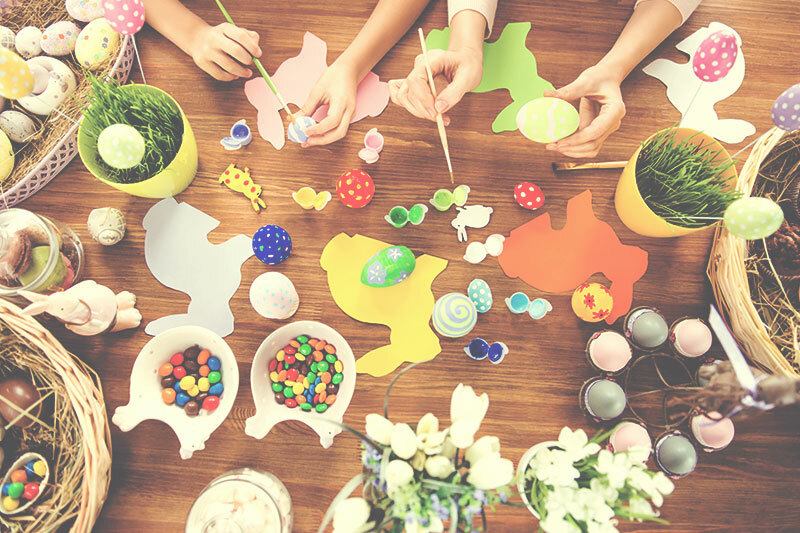 Whatever crafts you decide to do with the kids this half term, be sure to check out The Works’ fantastic range of art supplies and craft kits. There’s everything you need to make sure the kids are kept entertained over Easter. If you need some extra creative support over the forthcoming months, Little Squigglers can help! It’s a messy, gooey, arty club that inspires young children to be creative, and regularly hosts under 5s craft workshops at PE1. For the summer period, Little Squigglers will be holding pre-school classes on Thursday mornings from 10am to 11.55am for various age groups. The classes provide the perfect opportunity for children to experience sensory activities you may not want to embark on at home and provide a fun way for your under 5s to grow in confidence and develop new skills. Each week in the Little Squigglers Toddler classes, children (and parents) have fun being immersed in activities based around a storybook theme whilst learning new skills in a safe and secure environment. Messy play for babies or toddlers is not only great fun but is a way for your child to learn new skills through sensory play, make new friends, develop greater confidence and independence and increase language and communication skills.